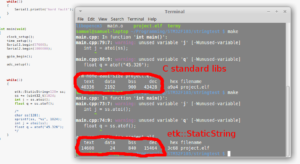 Using the C standard libraries for string processing is a terrible option when it comes to programming micro-controllers. 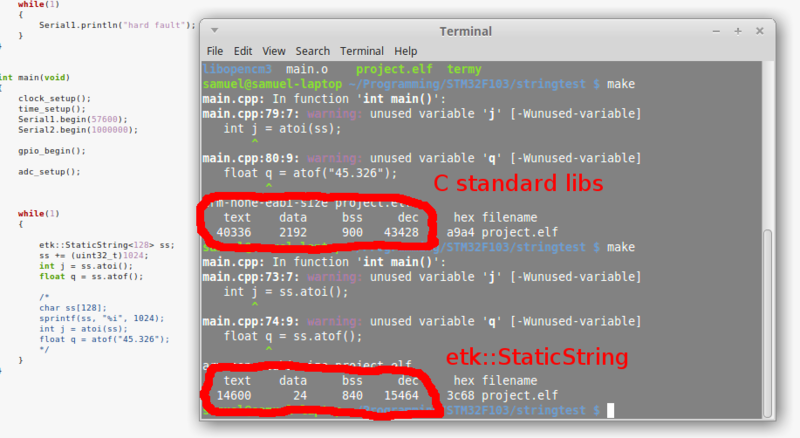 The standard C string functions can be unsafe and most C string functions are prohibited by high integrity coding standards. They will also bloat compiled binaries by up to 30Kb. The Embedded Tool Kit offers a lightweight C++ alternative. ETK contains everything you need to work with strings on micro-controllers in these classes. Rope is a C string wrapper. It does everything that’s needed to use C-string effectively such as concatenation of other strings, floats and integers, converting strings to floats and integers, calculating string length, comparing strings and so on. Rope requires a pointer to a C string (character array) and the length of the array so it can avoid buffer overruns. Rope will then perform operations on this C string. rope.append(5.2176f); //buffer contains "5.21" rope.clear(); //empties buffer by setting all chars to null '\0' rope.append(5.2176, 1); //buffer contains "5.2" rope.clear(); rope.append(5.2176f, 4); //buffer contains "5.2176"
rope.append(5.2176, 1); //buffer contains "5.2"
rope.append(5.2176f, 4); //buffer contains "5.2176"
StaticString is a string template class that does not secretly allocate memory. The maximum length of a StaticString is specified by the template parameter. StaticStrings are just a thin wrapper over the Rope class. They essentially are a rope, but contain their own memory. StaticString actually does provide a few more functions than Rope. It can insert and remove characters. And finally, StaticString has to_upper and to_lower functions. ss = "lowercase"; ss.to_upper(); //ss contains "LOWERCASE" ss.to_lower(); //ss contains "lowercase"
The tokeniser can use virtually any type of string object. The only limitation is that the input string provided to etk::make_tokeniser MUST be null terminated (i.e. have a null character ‘\0’ at the end). Examples of string types that can be used are C strings (character arrays), StaticStrings, Rope, std::string and pretty much anything that allows the use of subscript operators ( operator  ).